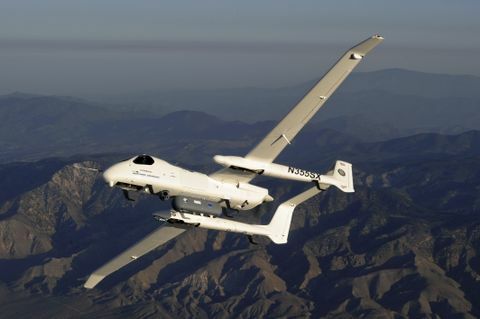 SAN DIEGO, June 8, 2012 -- Northrop Grumman Corporation (NYSE:NOC) completed a series of test flights May 17 that demonstrated the transmission of imagery, video, voice and digital messages using a pod-based airborne communications system. The SmartNode Pod is based on the Battlefield Airborne Communications Node (BACN) technology that allows real-time information to be exchanged among many different military and commercial radios and relays full-motion video â a critical capability for deployed warfighters. Northrop Grumman's Firebird aircraft flew the pod during the demonstration effort at Mojave, Calif. Firebird is an optionally piloted aircraft that operates multiple intelligence, surveillance and reconnaissance (ISR) payloads simultaneously. "By using proven technology developed for the BACN program, the lightweight SmartNode Pod is ready to mount on many different military aircraft and provides a much-needed capability controlled by the deployed commander," said Claude Hashem, vice president of Network Communications Systems for Northrop Grumman Information Systems. "The pod can connect to the high-altitude BACN platforms, ground operational centers or other pods for beyond-line-of-sight connectivity and access to high-level ISR and command and control information." The Northrop Grumman-developed SmartNode Pod flight tests demonstrated how encrypted digital data and voice connectivity are provided directly to mobile ground units and command centers. It provides critical range extension and gateway capability in a form factor controlled by the lowest level commanders. The SmartNode Pod is designed for use on a variety of aircraft needed to support the Joint Aerial Layer Network (JALN). JALN is a high-capacity communications network management system planned by the U.S. Department of Defense that would expand on the existing aerial network and link ground, space and airborne communications nodes.